The Frugal Family Life: $1/1 Minute Maid Juice Box 10 Pack = $.97 at Walmart! $1/1 Minute Maid Juice Box 10 Pack = $.97 at Walmart! Now here's a great deal for ya! 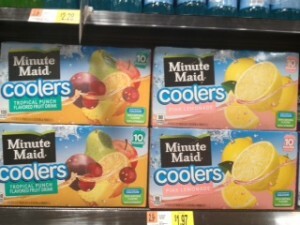 Head over and print this $1/1 Minute Maid Juice Box 10 pack and use it to get the Minute Maid Coolers 10 pack for only $.97 at Walmart!